The first time I came across David Weinberger was when I read his paper Tagging and Why it Matters* a few years ago, so before I even opened the book I figured the central premise of Too Big To Know would be closely linked to concepts like information overload, social filters and metadata. Whilst this is certainly true, Weinberger's analysis is thankfully not that simplistic and one-sided. 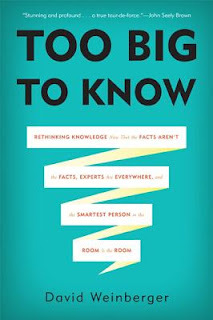 He begins his argument with the idea that information overload is not a new problem 'created' by the internet, echoing a similar point made by James Gleick in last year's excellent The Information. Ever since Gutenberg's printing press individuals have felt overwhelmed by the idea that there is more information out there than one can possibility assimilate in a lifetime (so there goes my dream of being a Renaissance man polymath...). The internet is simply the latest incarnation of a longstanding problem, but as Weinberger argues it is not so much a 'problem', but rather a fact. In print form, ideas were theoretically connected but often physically separate; in the online world knowledge is communicated, linked and shared within the context of a network (or multiple networks) - and it is the network which becomes most valuable. Expertise is no longer something which can be narrowly defined. Instead it is now collaborative and multidisciplinary, and the opportunity to connect knowledge and ideas in this way stems from the concept of the network. 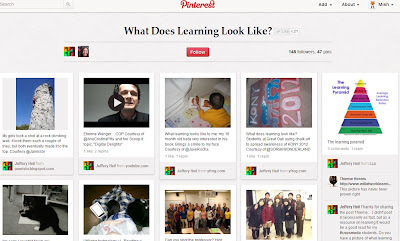 As information becomes increasingly open, we see post-filtering (i.e. a publish then filter model) rather than pre-filtering (the traditional gatekeeping role played by publishers). This ensures that false negatives (good content which should be published but isn't) are minimised, even if large volumes of seemingly valueless content are also published. In the same way that Clay Johnson suggests responsibility lies with the individual user to consume a healthy 'information diet', Weinberger invokes Clay Shirky's "filter failure" - the idea that we need to develop better and more efficient means of filtering information. Logical stopping points like the authoritative print reference sources of old are harder to see online, but are there nonetheless. Indeed Weinberger's pragmatism brings an awareness that in most cases we utilise information like any other product - as a means to an end - in short, "knowledge is not a library but a playlist tuned to our present interests." Weinberger also offers an interesting critique of The Shallows by Nicholas Carr and the premise that the internet is negatively influencing our information behaviour by encouraging scanning - ultimately making us lose sight of our higher order thinking skills. Conversely, printed books promote engagement with the longer thought and stimulate creativity and critical thinking. Weinberger respectfully questions this notion however, arguing instead that books are narrow sources of information limited by their form and design - the need for a beginning, middle and an end, all of which must generally avoid digression due to physical constraints. These attributes are not required with electronic publishing, and surely the opportunities presented by richer multi-layered arguments, collaboration and instant feedback are a good thing? Furthermore, accepting the new open ecology of information as a given automatically places a greater emphasis on the need for critical thinking and appraisal, including a responsibility on individuals to fully reflect on and assess the information they find. I would certainly like to think this is true and will be borne out over time, however whether it is over-optimistic remains to be seen. Myself and Mr Weinberger have our fingers crossed. 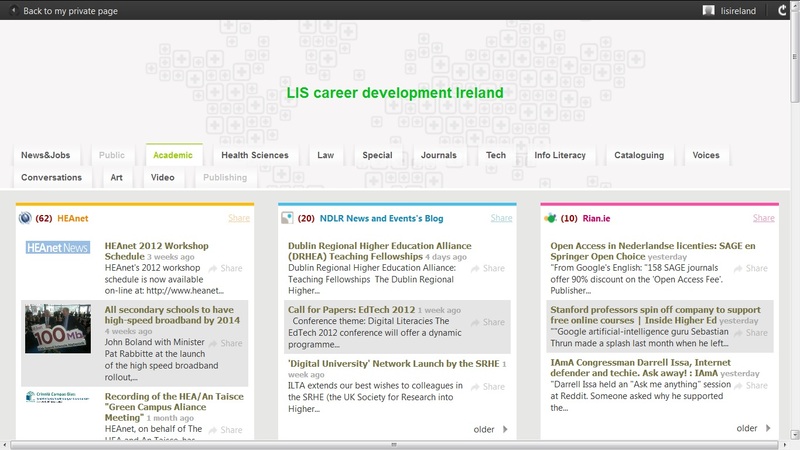 http://www.netvibes.com/lisireland is a new Netvibes RSS portal which has been compiled by Giada Gelli from the LIS Career Development Ireland group. 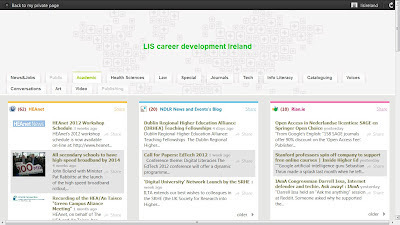 LisIreland includes feeds from Irish public, academic & special libraries, general library blogs & journals, and specialist resources for cataloguing, information literacy, health sciences and law. The portal is still a work in progress and more feeds from LIS blogs, journals and news sources will be added over time based on input from members. Thanks to Giada for the hard work involved in putting together this very useful resource. Desperate times require ingenious measures. Shutesbury Public Library is in need of a new library building. So this is what they came up with to push their cause. Guest post: Library Internships, what’s the story? Caroline finished her MLIS in 2009 and then went on to spend a year working in libraries in Sydney, Australia, since returning she has spent her time volunteering and gaining further work experience in libraries and archives while searching for more permanent work. She is currently enrolled in a Job Bridge Internship at Dundalk Institute of Technology (DkIT), which she writes about here, and is soon to take up a paid internship at The National Library of Ireland. Her interests include, Information Skills training, Social Media in Libraries and research and reference work. Since August 2011, many people have been taking up Job Bridge internships across the country in a variety of disciplines. It was announced last week that 5,000 of these internships have now been filled. 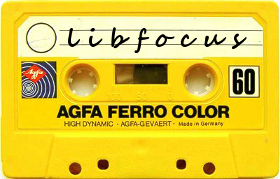 The scheme has been greeted with mixed reaction; some see it in a positive light as a stepping stone for recent graduates who wish to gain experience in their field while others have used terms such as ‘exploitation’ and ‘free labour’ to describe what they see as companies getting qualified workers for free, but what does all this have to do with Libraries? I am an MLIS graduate currently enrolled in a Job Bridge internship at The Dundalk Institute of Technology (DkIT) Library since September 2011. 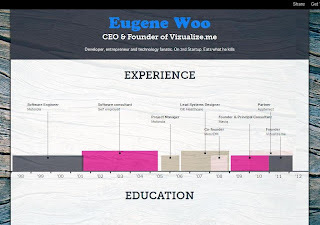 This is my account of the work I have been doing there and how I have found the experience. If you have recently graduated from an MLIS, GradDip-Lis, MSc LIS or similar and are finding it difficult to find Library work in the current job market then you may also be considering taking on an internship. While I am offering no strong opinions either way on the Government’s Internship scheme on the whole I will say that, for me personally, this has been a worthwhile experience and my advice to recent LIS graduates thinking of starting an internship would be to go for it. Before the Job Bridge scheme was introduced this position was available for several years as a FÁS Work Placement Programme (WPP) so there is a well established history in DkIT Library of interns coming and going over the years, many of whom I understand have subsequently gone on to find employment in Libraries elsewhere. Essentially the work I’m doing is that of a Library Assistant or a Librarian of a Grade 1 to 3. All staff share shelving duties and shifts at the Issue desk so I have had as much responsibility in frontline services such as these as any other member of staff. In the beginning I briefly shadowed every member of staff individually to learn a little about the variety of work that each person here does. Gradually I found the areas that most interested me and was encouraged to take on more projects and tasks in these areas. I am sometimes given specific projects to work on but I’m also encouraged to work on my own initiative taking on work as I see there is demand for it. I have attended staff meetings which I have found a great learning experience for seeing how decisions regarding the running of the Library are made. I have made suggestions at meetings which I was then asked to follow up on and see through, for example, I suggested the Library have its own YouTube channel for the purpose of hosting Information Skills video tutorials for students and subsequently set this up. I made simple videos using Screecast-omatic to demonstrate searching the OPAC, requesting a book, placing a hold and using the Ebrary collection. All in all I feel I have been treated as just another member of the team and that my ideas and opinions hold as much weight as would any other employee. Other projects I have worked on have included, designing and administering a student survey regarding late opening hours and analysing the results, doing small research projects and writing reports, analysing statistics i.e statistics of overdue loans, statistics of journal usage and inter-Library loans etc, compiling and editing a catalogue of artwork in the Library and organising and promoting student events in the Library. I have worked in Libraries before so this is not my first experience of Library work however this has been an opportunity to develop my skills in areas that I have not worked in before. Most of my experience is in Public Libraries apart from a short six week work experience which I undertook at Dublin Business School (DBS) so I am enjoying working in an Academic Library and dealing with students. It has been an opportunity to learn more about acquisitions, databases, journal subscriptions and corresponding with lecturers regarding reading lists etc. I became involved in the Marketing Team which involves coming up with ideas for Library events, arranging these events and promoting them throughout the college and outside. I didn’t go into this internship with the intention of gaining experience in Marketing or Events Management as they are not something I would necessarily associate with Librarianship and yet I have and in fact this has become my favourite part of the job. I’m now working on writing Press Releases for local papers to let the wider community know about some of the recent activities and services which the Library has been providing to students. My advice with internships would be that you get out of it what you put in, so make the most of it and take on as many projects as you can to build on your own experience. If you are an LIS graduate and looking for work, an internship like this could be a great way to get started in your Library career. Equally, if you are an experienced Librarian who is currently between jobs, an internship could be a good way to upskill while you look for more permanent work. That at least, is what it has been for me.